L-Glycine Free Form Vegetarian - 1 lb. Glycine is a non-essential amino acid and has the simplest structure of all amino acids, allowing it to fit easily within protein chains and make space for structurally larger amino acids. This feature makes it very important for specific bodily function. 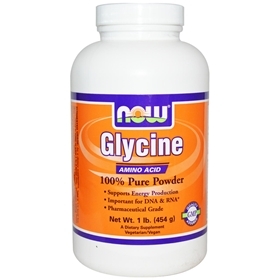 Glycine is used to help create muscle tissue and convert glucose into energy. It is also essential to maintaining healthy central nervous and digestive systems, and has recently been shown to provide protection from some types of cancer. Glycine is considered a glucogenic amino acid, which means it helps supply the body with glucose needed for energy. It helps regulate blood sugar levels, and thus glycine supplementation may be useful for treating symptoms characterized by low energy and fatigue, such as hypoglycemia, anemia, and Chronic Fatigue Syndrome. It is necessary for central nervous system function, & new research has shown that this amino acid can help inhibit the neurotransmitters that cause seizure activity, hyperactivity, and manic, bipolar depression. Glycine is converted to another neurotransmitter, serine, as the body needs, and may be beneficial in the management of schizophrenia. Studies have shown that glycine also helps improve memory loss in those that suffer from a wide variety of sleep-depriving conditions, Parkinson’s disease, Huntington’s disease, jet lag, and working too hard. Glycine is essential for a healthy, normally functioning digestive system. It helps regulate the synthesis of the bile acid used to digest fats, and is included in many commercial gastric antacid agents. It has been shown to support the thyroid, and is helpful for treating Hajimoto's disease. Suggested Use: As a dietary supplement, take 1/4 level teaspoon mixed in water or juice with or between meals one to three times daily. Free of: starch, salt, sugar, yeast, wheat, gluten, soy, milk, corn, preservatives, additives. NOW Taurine Pure Powder, 8 oz. Disclaimer: No claims found on our web pages or in print have been evaluated by the Food and Drug Administration. Products and descriptions are not intended to diagnose, treat, cure, or prevent any disease. No claim or opinion on these pages is intended to be, nor should be construed to be, medical advice. Please consult with a healthcare professional before starting any diet or exercise program. SuperVits.com assumes no responsibility for product claims and guarantees made in product descriptions on this website. Product descriptions and images are the property of the respective product manufacturers. Prices and information on these pages are subject to change without notice. Actual product received may appear different than product pictured or described on this website due to manufacturer packaging and formula changes. SuperVits.com is not responsible for typographical errors on these web pages. © 2017 Discount Health Foods, Inc. All Rights Reserved.